JN-TEK grating ruler JNLET30, spring-driven rod scale (economical digital gauge), the measurement form is similar to dial indicator, dial gauge. It is a precision small grating measuring system suitable for small-scale precision measurement. It is especially suitable for measurement, robot technology, medical equipment, precision modern processing equipment. 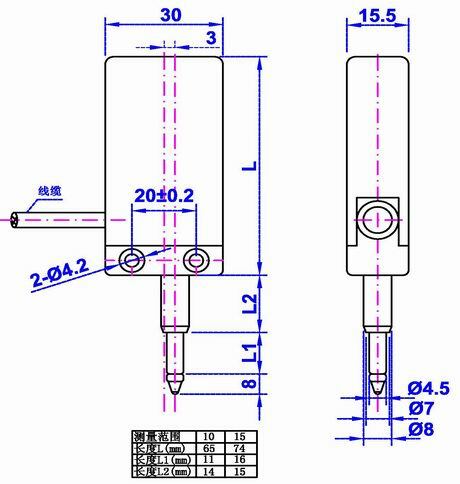 It is usually used for continuous thickness measurement. The grating scale JNLET30 converts the linear displacement change into Pulse signal. The number of pulse signals corresponds to the distance traveled, and the pulse frequency reflects the speed of motion. The main part of the grating JNLET30 consists of a set of precision linear sliding bearings, return springs, glass gratings and LED illumination systems. The output of the grating JNLET30 is a rectangular square wave. A, B phase two-way waveform with 90° difference, can indicate the moving distance and direction.